Book Review | Seamus the Sheltie to the Rescue! 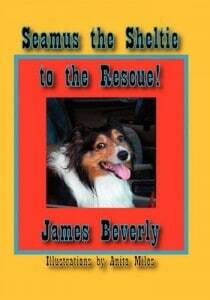 Title: Seamus the Sheltie to the Rescue! Seamus the Sheltie to the Rescue! by author, James Beverly is a delightful children’s book for young animal lovers. This is the longest read aloud story that I have ever read to my little ones. Initially I was afraid that it may have been intended for the attention spans of older children but my 3, 4 and 5 year olds were captivated from the first chapter. This book is the story of Seamus the Sheltie and his animal friends as they go on exciting adventures learning about life and its challenges. I would finish a few pages and tell them that we would continue more the next day and they would beg and plead for me to continue until that particular story had concluded. This book is imaginative and encouraging for young children who will inevitably face many of the same situations encountered by Seamus and his companions. I appreciate that it encouraged my children to ask questions about the scenarios we read about in the story. There is even a wonderful supplemental discussion appendix at the end of this book. Though a work of juvenile fiction, I would recommend this book as an early read aloud and then offer it again as an independent read when the child is a bit older. The cover and chapter of photograph of the “real” Seamus bring a smile to our faces and the illustrations by Anita Miles are lovely. You can learn more about the award winning, Seamus the Sheltie book series by visiting the author’s website. This would make an excellent book series for summer reading. We have two dogs in our family, so I loved reading your review! Thank you!